Improve brand experience using automated marketing campaigns that react to how your subscribers engage with emails, websites and forms. Set off on the right foot by giving people everything they need to get started. Professionally complete the sale process and don't miss out on up-sell opportunities. Simple and effective reminders for flights, hotels and any other date based bookings. Get creative and use drag & drop to easily design complex user journeys for your subscribers. Completely personalise each journey by connecting building blocks that include things like delays, decisions, emails and segmentation. Guide people down different paths depending on what they do or don't do and what information you know about them. Turn subscribers in customers by designing automated actions that react to the actions people take so that you can drive them towards completing the goals you've set. 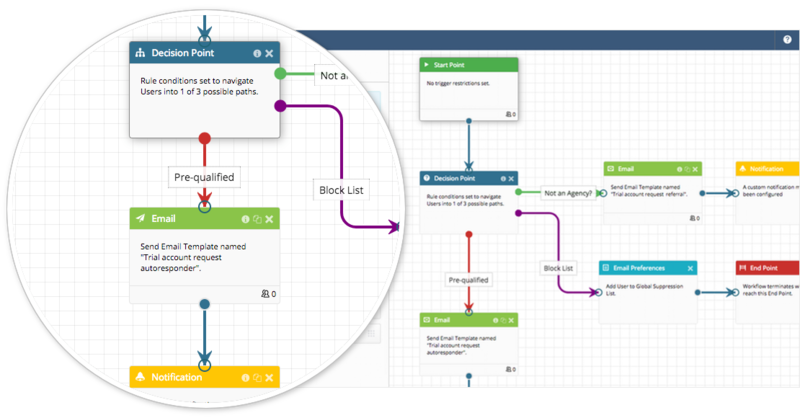 Design your workflows to handle as many complex scenarios you need using our easy to use drag & drop workflow designer interface. Websites & forms can be designed to do lots of clever things but once people submit their data the next steps are pretty common. Integrate your websites & forms to easily add people to Lists, set custom delay periods, take automated decisions to send people down different paths and deliver timely and targeted emails all using automation. Do way more than only resending to people that did not open the initial campaign. 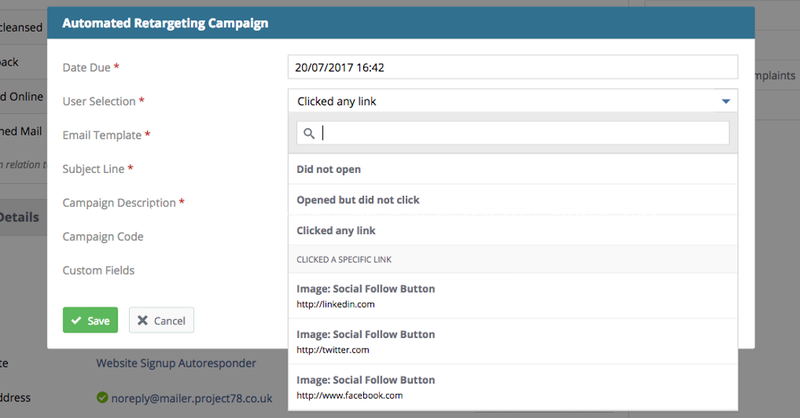 Our automated re-targeting feature enables you to send follow-up campaigns to those that didn't open, opened but did not clicked, clicked any link or clicked a specific link - you can even set multiple follow-ups to handle all possible outcomes. Here's more info on just a few of the other features available for creating automations. Filterable reports provide detailed analysis into all aspects of your workflows. Each report contain a live action feed of what's happening within each workflow. 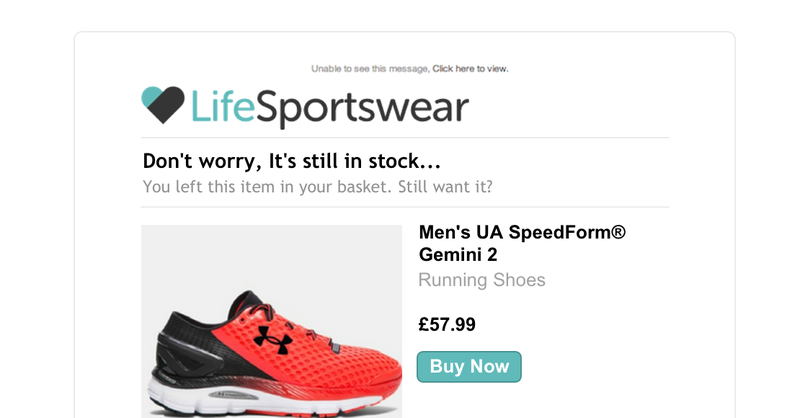 Setup customised email alerts to track the details of newly triggered workflows. Explore the exact path a person takes using an easy to understand flow report. You're not restricted to one List, choose as many as you like! 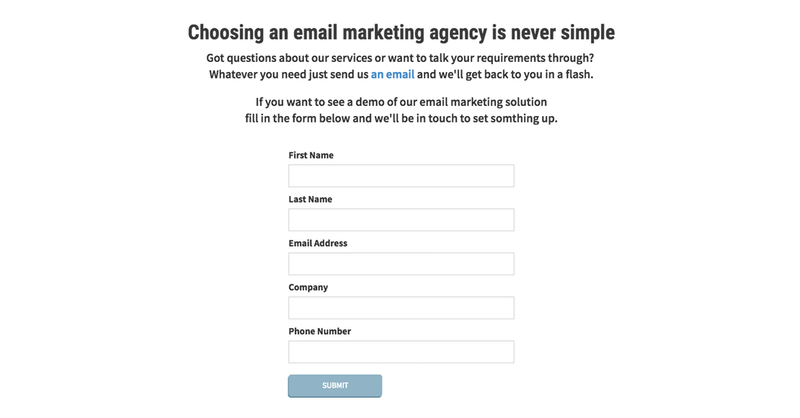 Track and measure the effectiveness of automated email calls to action.